No big surprise that Bhutan, the happiest country in Asia, plans to hold onto its title by converting most of its fossil-fueled vehicles to electric cars. The democratic constitutional monarchy of 725,000 in Bhutan rates high on the recently contrived global happiness index. In recent years, it has consciously pledged itself to sustainability and a clean environment. In keeping with these objectives, Bhutan has started to replace its old taxis and government vehicles with Nissan Leafs and charging stations. The first roomy zero-electric compacts will take the road in March. 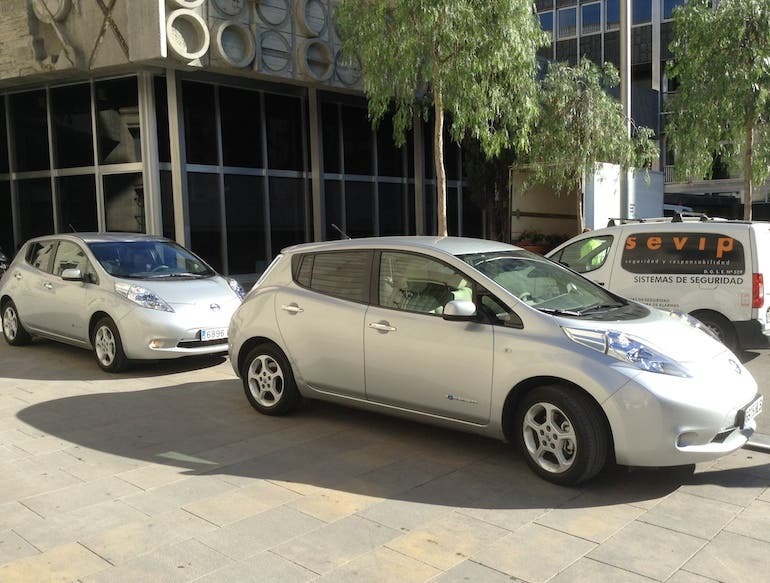 Nissan Leafs spotted in the wild in Barcelona, Spain. Nissan’s midsize hatchback will start off the changeover. With a city/highway rate of 129/102 MPGe, the model rates high (4.7 out of 5) among current drivers. The price tag is apparently right, and the landlocked, mountainous nation has a local facility ready to assemble the cars from parts. Bhutan has electric energy to spare. Almost 100% of its power comes from hydro plants. Harnessing the tumbling water of the Himalayas makes the tiny nation the 27th largest energy exporter in the world. Despite hydro’s monopoly over other renewables, Bhutan is one of the lowest global emitters of carbon dioxide from consumption of energy. However, much of the profits from today’s electric power sales in the nation currently channel into imported fossil fuels for transportation. Going 100% electric with cars offers Bhutan the opportunity to slow or omit these expenditures and exploit the power needs of its very populous and rapidly developing neighbors, India and China. The nation comprises only 712 sq mi, about the size of North or South Dakota. Short trips will provide an advantage for electric cars, although we seem to see higher driving ranges almost daily. Currently, few citizens of Bhutan own private vehicles; most use taxicabs for four-wheeled transportation. Three-and-a-half thousand taxis serve the residents of Thimphu, the nation’s capital. Electrics are also a great fit for Bhutan because of their versatility. The new fleet is expected to handle well in local conditions with wide temperature ranges, snow, high winds, fog, and heavy monsoonal rains and flooding in the summertime. Acceleration stronger than that of internal combustion engines will also be a plus, as will FWD. In a country where only about 60% of the roads are paved, handling can be critical. The Leaf’s 24kWh rechargeable lithium-ion battery is advanced and energy-dense. Half the weight and twice the power of nickel-metal hydride batteries gives the Leaf a big advantage over hybrid vehicles. The batteries are mounted under the floor pan and rear seats. The 2014’s new 6.6 kW onboard charger refuels twice as fast as last year’s model. Nissan has also improved the Leaf’s regenerative braking. “Zippy” is how some people describe the car’s advanced 80kW AC synchronous electric motor. For fleet use, the EV’s ultra-low maintenance will offer considerable time and money savings. And the environmental friendliness of electric transportation, amply supported by established hydro power, gives EVs a great advantage over fossil-fueled vehicles in preserving the nation’s air quality, farms, and centuries-old Buddhist hillside monasteries. Tshering Tobgay, the progressive new Prime Minister, wants to cut Bhutan’s fossil fuel imports by a whopping 70%. Part of this ultimate goal involves transforming the capital city of Thimphu into an “electric city,” even a possible research and development center for EVs. Tobgay has reportedly conferred with both Tesla and Renault-Nissan on implementation. After talks with Nissan’s CEO Carlos Ghosn, Tobgay committed to an initial order. The country has also developed a local facility to assemble the cars from parts. Leaf taxis already operate in New York City, Sao Paulo, Brazil, and Osaka, Japan. I took one from Chicago’s O’Hare airport just a few weeks ago. Although cabdrivers in energy-poor Japan have reported dissatisfaction with battery-range degradation, this will not matter so much to a nation that exports power. By the way, my airport road test turned out quiet, smooth, impressively spacious and comfortable, and even–yes–economical.